An excellent plant for difficult positions, tolerates shade and pollution, large attractive evergreen foliage a perfect background foil for other plants. This variegated form of Fatshedera forms a small to medium sized evergreen shrub with large thick leaves with a central blotch of bright yellow-green. 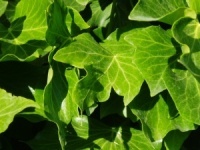 In autumn it has white ivy-like flowers. A great plant for colour, even in a shady spot. An interesting hybrid of Fatsia and Hedera, the form Variegata has an attractive creamy white margin to the leaves. Particularly good plant for shady places.